The 25 metre motor yacht Lady O, listed for sale by Todd Rittenhouse at Northrop & Johnson, has received a price reduction of $55,000. Built in GRP by US yard Northcoast to a design by Jack Sarin, Lady O was delivered in 1998 and had a thorough refit in 2007. An interior in satin finished American cherry wood joinery sleeps eight guests in four cabins consisting of a master suite amidships, a VIP suite, a double to starboard and a twin to port, all with full en suite facilities. Entrance to the light and bright saloon of this yacht for sale is through the aft deck or port and starboard wing doors via the enclosed pilot house. The saloon has large viewing windows and a fully updated entertainment centre along with a new headliner, updated lighting and a forward open dining area. Moving forward and to port is the updated galley. To starboard is a day head, while a staircase leads up to the flybridge and there are stairs leading down to the owner's sleeping accommodation. Outside, on the covered flybridge, there are two helm chairs plus large L-shaped seating and a table to port. To starboard guests can enjoy dining under the stars at a twin built-in barbecue, sink, a small fridge and additional storage. Her top speed is 26 knots and her power comes from two 1,200hp MAN diesel engines. 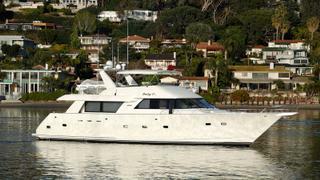 Lady O is now asking $1,695,000.